Kita Thomas says that her brother, Danny Ray Thomas, "was not in his right mind"
The sister of an unarmed Houston man fatally shot by a sheriff's deputy said her brother's depression had escalated in the almost two years since his estranged wife allegedly drowned his two young children in her bathtub. Kita Thomas told KPRC-TV in Houston that her brother, Danny Ray Thomas, "was not in his right mind" as she watched cellphone video recorded by civilian witnesses to the March 22 shooting. The deputy had responded to an altercation that started after Thomas was seen wandering in the street with his pants around his ankles, hitting passing cars with his hands and talking to himself. "Whenever he got into that mind frame, thinking about his wife and his kids, he just felt like he was alone," she said, her voice breaking into sobs. Court records, arrest affidavits and filings in the case against Thomas' estranged wife, Sheborah Thomas, on two charges of capital murder show a series of arrests and escalating issues with drugs and possible mental illness for both parents. Danny Thomas, sometimes called Danny Boy, entered the Harris County Court system when he was 18-years-old for burglary and petty theft charges, according to the records. A series of drug arrests began in 2006 with a marijuana possession charge and ended with Thomas serving a three-year sentence for possession of PCP. That's where Thomas was when he learned his wife had allegedly drowned his children. In the middle, there were moments when the state argued Danny and Sheborah weren't properly parenting the children. Danny Thomas was charged with family violence after an altercation with his wife turned physical and ordered to stay clear. Divorce papers were filed in 2012, but court records did not show the divorce being completed. Child Protective Services briefly gave custody of the two children to Sheborah Thomas' mother when her then 2-year-old daughter was found wandering with a homeless man who told police he was high on PCP. Less than three years later, after the children were returned to her, police say Sheborah took them individually into her bathroom, placed them in the tub and held their heads under water as they struggled. Investigators said she tried to dig a hole to bury their bodies but could not dig deep enough. They said she then placed the children's bodies under a neighbor's house. Police said she calmly told a friend who had come to help her move that she had killed the children. The friend called police. Sheborah Thomas is awaiting trial on two charges of capital murder scheduled for later this year. Meanwhile, Danny Thomas' family, who did not return messages left Monday by The Associated Press Monday, are preparing for another funeral. Houston police officials said Thomas' erratic behavior caused a physical altercation to begin between Thomas and the driver of a car he had hit. The deputy, identified as Cameron Brewer, was driving by when he witnessed the altercation and stopped to break up the argument. In cellphone videos, Thomas can be seen waddling toward the deputy with his hands at his side and his pants still caught around his ankles. The deputy orders him to stop several times as he walks backward away from Thomas with his gun drawn. Brewer fired one shot, hitting Thomas in the chest. Thomas was later pronounced dead at a hospital. Investigators had said the deputy believed Thomas may have had a weapon in his hand, but no weapon was recovered at the scene. Sheriff Harris County Sheriff Ed Gonzalez said Brewer had a Taser which he did not use, The New York Times reported. Deputies had been trained on using nonlethal force during encounters with people who may have a mental illness, he said. 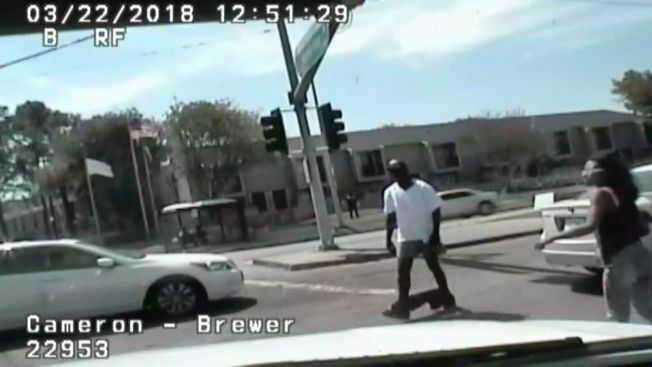 Brewer had also been issued a body camera two hours before the shooting. The camera's battery was charging at the time of the shooting.